The Paper deals with economic principles as found in the more ancient sources of the Vedic period in so far as this is possible. Unlike a particular application of a law which may well be affected by circumstances and thus appear to be different from place to place and time to time, a principle has an unchanging universal quality. Despite few economic terms used throughout the text like Land Value Taxation (which means simply taxing the value of land alone) there is nothing complex or complicated in this study and reading it does not require any training in Economics. By showing the relation of the Indic principles to certain modern concepts and particularly to land value Taxation the paper goes a long way in bringing into light many valuable bringing into light many valuable economic concepts and practices supported by an institutional framework. Thus we meet the same concern about the distribution of wealth that occupies the mind of modern economists. How much does a man or a family need to earn and how much should be given to the royal treasury (i.e. the State) and how should these be determined? Or to put it in other terms, how should taxation be levied? Then, how should the State should lending operate and what would be fair rates of interest? 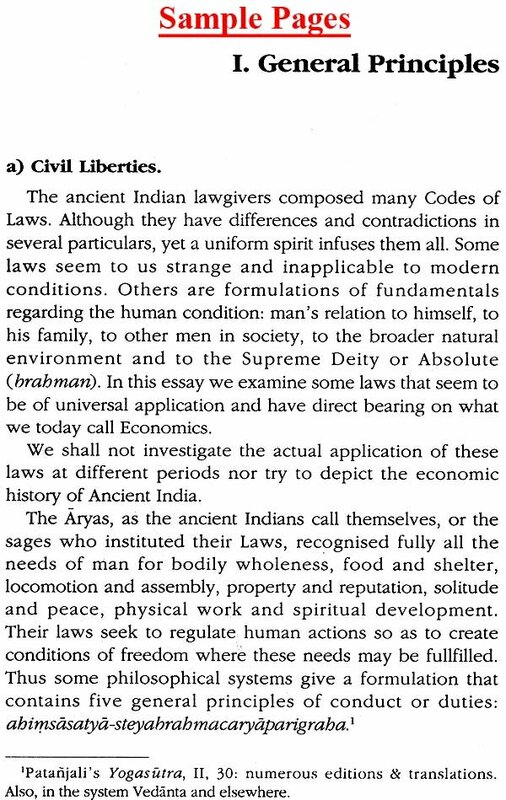 The law giverse in ancient India were fully aware of all these issues. One aspect of modern economies that is not treated by the ancients is unemployment because this problem appeared as such, on a large scale, only with the increase of population, the land enclosures (Privatization) and the industrial revolution in Europe at the end of the 18th century. But the texts take it for granted that people should feel secure in their different employments. A most surprising feature is the principles of free access to land for all and the land Value Tax which should be the source of Government revenue (and expenditure). It is surprising because land Value Taxation is supposed to be a fairly modern concept. Dr. Nicholas Kazanas is Greek-born. He was educated chiefly in Britain. He read English Literature in University College; Economics and philosophy at the School of Economic Science; Sanskrit in the School of Oriental and African studies – all in London. He did his post-graduate studies at SOAS and in Pune and Varanasi. He taught for some years in London. For more than 20 years now he is the Director of Omilos Meleton, a Cultural Institute in Athens. He has various publications in greek; several peer- reviewed academic Journal, western and Indian have printed his articles on Indology. First, despite some few economic terms used throughout the text like Land Value Taxation (which means simply taxing the value of land alone) there is nothing complex or complicated in this study and reading it does not require any training in Economics. I have made it all very simple. The reader need not be deterred also by the names of Adarn Smith and other economists. This study was first completed back in 1992 in rough notes to meet the needs of some students in Athens and London. It remained in that form for 10 years. Then new needs arose and after some study of new literature on the subject (e.g. Madan 1981, mainly Ambirajan 1994 and Rangachari 2002), I made revisions and cast the notes into the present format showing the relation of the Indic principles to certain modern concepts and particularly to Land Value Taxation. The study deals with principles as found in the more ancient sources of the Vedic period in so far as this is possible. This should be grasped very thoroughly. Unlike a particular practice or application of a law which may well be affected by circumstances and thus appear to be different from place to place and time to time, a principle has an unchanging and eternal quality. I do not deal with actual practice except incidentally. For this reason, of course, I do not examine at all economic practices in the medieval period and more recent times, for which there is ample documentation. (See for instance Rangachari 2002 and Madan 1981.) 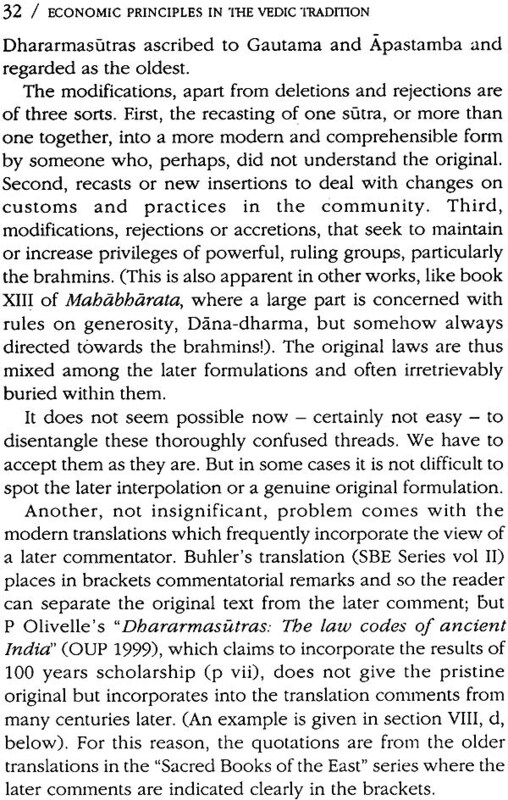 If the readers have this in mind they shall not wonder at the almost ideal or idyllic conditions that are presented in the pages that follow and the absence of references to the real-life practices that appear not only in the late centuries BCE but even in the Epics and much sutra literature. 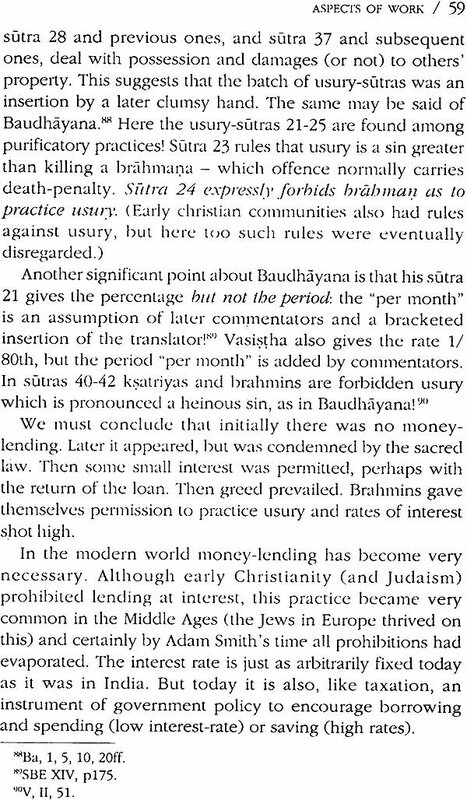 Kautilyas Arthasastra incorporates some of the wisdom of the principles formulated in the early Vedic period but it is obvious that conditions have changed and many of those principles have been forgotten or covered with distortions. The polity in Arthasastra is a mixture of private enterprise and state control: what we call today 'social democracy' or 'democratic socialism' (despite labels like "liberalism" or "free economy" and the like). 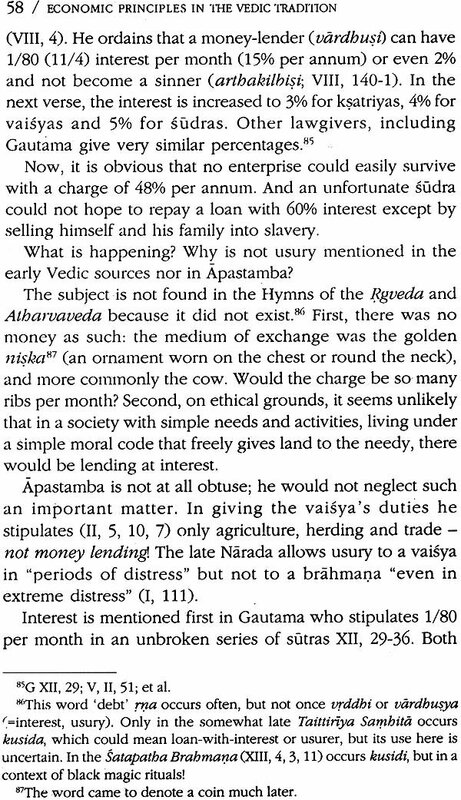 Nonetheless, in the Vedic and the later texts we meet the same concern about the distribution of wealth that occupies the mind of modern economists. How much does a man or a family need to earn and how much should be given to the royal treasury (i.e. the State) and how should these be determined? Or to put it in other terms, how should taxation be levied? Then, how should the State dispose of its revenue? Also, how should lending operate and what would be fair rates of interest? The lawgivers in ancient India were fully aware of all these issues. One aspect of modern economies that is not treated by the ancients is unemployment because this. problem appeared as such, on a large scale, only with the increase of population, the land enclosures (=privatization) and the industrial revolution in Europe at the end of the 18th century. But the texts take it for granted that people should feel secure in their different employments. A most surprising feature is the principles of free access to land for all and the Land Value Tax which should be the source of Government revenue (and expenditure). It is surprising because Land Value Taxation is supposed to be a fairly modern concept. It was first broached briefly by Adam Smith in his Wealth of Nations in the late 18th century; but he was very cautious in an age and country of landlords and advocated tax only on used land - not unused land and to modern writers of Handbooks on Economics (e.g. Lipsey 1966: 449-450; McCormick, Kitchin et al 1983: 427) agree that a tax on land values causes no distortions in the economy of anyone nation. Why then it is not applied is something of a mystery, but undoubtedly big financial interests (investments in land, oligopolies and the like) would be seriously affected not to say wiped out. Anyway, this idea is thought to have been especially embraced and promoted first by Smith's contemporaries, the Physiocrats in France C18th cent) and then most ardently by Henry George in the third quarter of the 19th cent. in the USA. But it turns out that very much earlier this idea, or one like it, was known to the lawgivers and sages of the ancient Vedic tradition. In the last chapter I show the close parallels. Of course, today Land Value Taxation is ignored by most economists because ownership of land is confused with ownership of houses, apartments and other goods. Another point to note is that the Vedic tradition emphasizes duty (dharma) and does not seem to care much for rights. This is true of other traditions even in the West. Yes, there were the rights declared in the Magna Carta of Britain of the early 13th century (in fact, in a series of Charts granted by the Sovereign and much later in the Bill of Rights of 1688) but even in freedom-loving Britain the focus was on duties. The big change Game with the Declaration of Independence in 1776 in the USA with its announcement of the rights to Life, Liberty and the pursuit of Happiness (Jefferson 1975) and the 1789 French Revolution which amplified these basic rights that brought a new era in which duties began to be brushed aside more and more. Today, only rarely will someone speak or write of duties. All one constantly hears is - rights, rights, rights: the right to this, the right to that. In this clamouring for rights unfortunately people forget that it is the observance of duties that secures the corresponding rights. For what use is my right to my person, life and wallet, when others decide to beat me up and take my wallet? If people do not seriously observe certain duties - not to harm, abduct, steal, imprison etc - the much vaunted rights are but hollow slogans. The Vedic tradition focused on duties again and again, period after period, text after text. One's entire embodiment was regulated by duties that led through the four asramas 'stages of life'; the state of a student, of an adult householder, of a retired anchorite and of a sannyasin who renounced everything, including duty, to attain moksa 'Liberation.' through self-realization. Economics was not an area on its own, separated from Ethics and Philosophy, or from the religious life in its widest sense. For this reason I examine at some length the ethical or religious duties of the king which correspond to a modern government's function. In today's India also the pressures of modern life and globalization are gradually but steadily pushing aside the traditional regard for duty in favour of rights while now the four asramas are by and large a tradition of the past. Nonetheless, discovering in the ancient texts the principles that may be said to pertain to the politico-economic life of a nation, as we understand this life today, was for me yet another awakening to the great knowledge enshrined in the Vedic tradition. 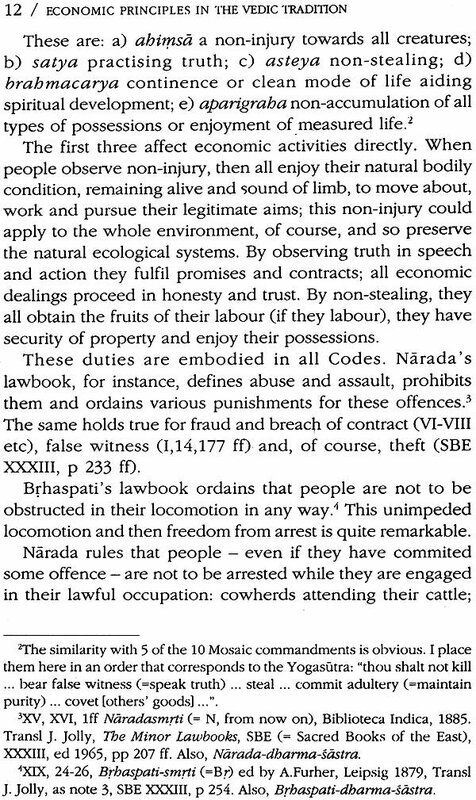 In the last chapter I bring together the ancient principles with some modern concepts and formulations and set up a frame of nine rights which secure man's freedom in society but only provided that people earnestly observe the duty not to infringe on the rights of anyone else. 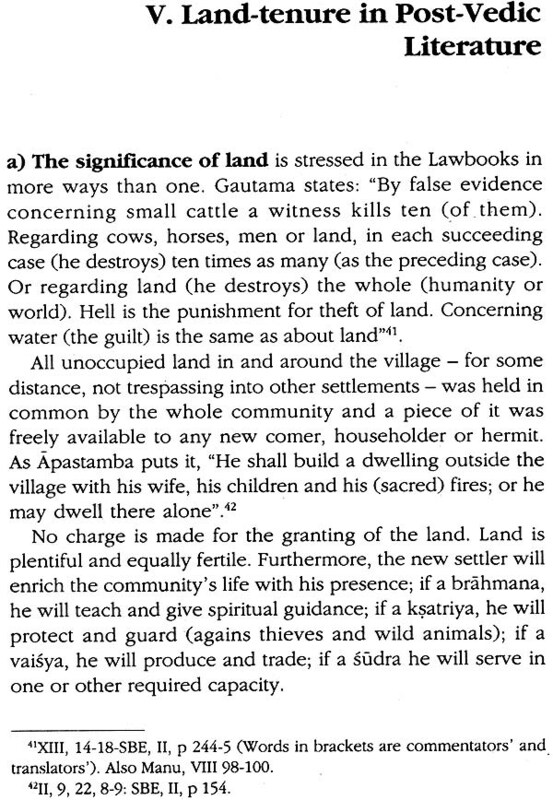 The most fundamental condition both for the individual and for society is that land should be freely available to all men who want it (see I, b and II below) and that it should not be held out of use when others are ready and able to use it effectively. This condition would seem to be secured by Land Value Taxation. This subject will be explored in the final chapter.